« Older: The Belize Blue Hole nominated for Best Caribbean Dive Site; VOTE now! 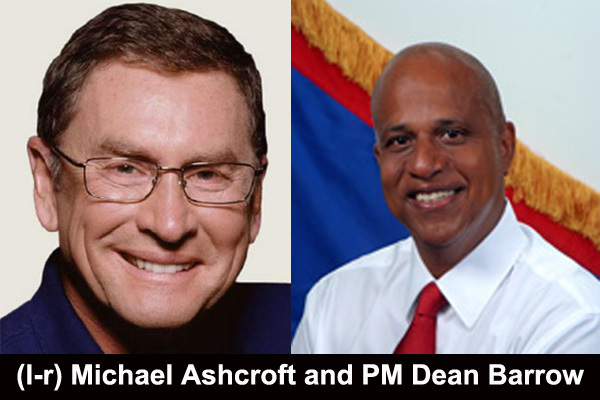 The Government of Belize (GOB) and British billionaire Michael Ashcroft remain at odds. In a press release dated January, 11, 2017, GOB is refusing to pay $50 million in three arbitration awards to the Ashcroft Alliance, reasoning that the Caribbean Court of Justice (CCJ) has ruled against them. The release stated that GOB won’t pay for those arbitration awards, which were derived from the accommodation agreement given to Belize Social Development Limited (BSDL) and a Settlement Deed given to BCB Holdings Limited by the People’s United Party (PUP) during their administration. BSDL and BCB are Ashcroft companies. “All three awards, which the United Democratic Party (UDP) administration on behalf of the people of Belize has tried to resist, are born of PUP cronyism, corruption and betrayal. Yet the PUP now gloats over the facts that U.S courts have upheld these awards that are the legacy of their unconstitutional and unbridled hustling and self-enrichment,” stated the release. During the Government’s first House Sitting for 2017 on Friday, January 13th, Prime Minister Right Honourable Dean Barrow indicated that the decision to not pay has nothing to do in defiance to the courts in the United States, who approved such awards. He said that is a matter of sovereign importance, since the CCJ had already ruled against these awards. “The BSDL award is in consequence of this government’s refusal to honour the accommodation agreement,” said Barrow. “An accommodation agreement that without a doubt, was utterly and outrageously illegal.” He declared the same situation for the BCB Holdings. “This was the one that caused the CCJ to talk about malignant tumours and to say that it doesn’t matter what the reasoning of the arbitral tribunal was to enforce that award, it would not only be repugnant to the public policy, the country, and the region, but also internationally” said Barrow. Barrow further explained why his government refuses to pay for those awards. “We resist to pay because in every case, the litigation arose out of the deceitfulness of the then PUP’s Administration Government,” said Barrow. “In the case of these companies, that perfidy only benefited the giver and the taker of these absolutely horrendous deals, which were, at the very least morally guilty of the worst kind of behaviour.” Barrow indicated that judicial relief was sought by these companies in the United States after losing in the courts of Belize and in the CCJ as well. Barrow continued defending his posture by referring to a brief filed by CARICOM’s Secretary General Irwin LaRocque and the Cooperative Republic of Guyana to US Solicitor General Donald Verrilli, Junior. They expressed their support for Belize. However, in the end, the US Solicitor General declined to support Belize, thus, giving way to the approval of the arbitration awards. Barrow concluded by stating that any further attempt to put Belize into further litigation expense will be considered an act of economic war.